Black Friday and Cyber Monday are tremendous opportunities for your business to make money. According to TechRadar, Black Friday 2015 is projected to be the biggest day of spending on the Internet – EVER. 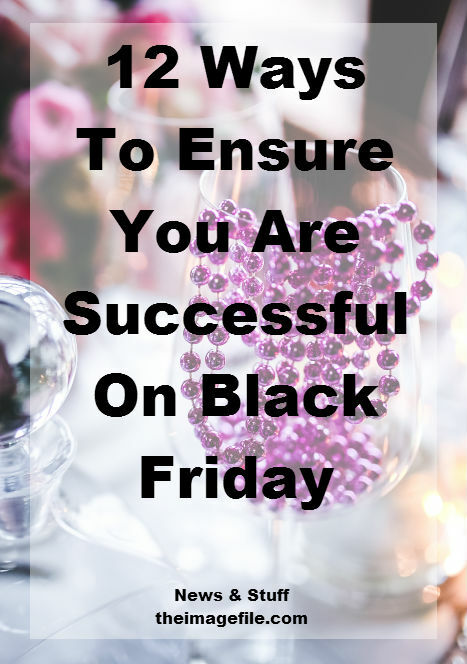 Running a successful Black Friday and Cyber Monday campaign can be overwhelming and stressful. So here are twelve ways to ensure that your business prospers during the Christmas break. It’s a good idea to take a look at all of your products, services and current offers ahead of time instead of leaving everything until the last minute. Consider creating a ‘planned sales chart’ in a programme like Excel, to give you a simple and clear outline of all your upcoming sales and offers. Note down the products and services you want to include in your holiday sale and schedule their start dates and sale prices. Also be sure to include any special promotions you want to offer specific groups of people such as past customers and last minute shoppers. This way when your sale start date arrives you have a clear, well thought out plan you can refer to instead of panicking the night before. Consider using beautiful graphics and visuals to promote your Christmas sales. Think about it – if you’re walking down your local high street and see two shop windows; one of which is plain and ordinary and the other colourful, festive and eye-catching which are you going to gravitate towards? The exciting one. So why not use banner ads to promote your Black Friday discounts or add special graphics to your home page to advertise Cyber Monday? Spend some time being creative and thinking about the design aspect of your marketing. Building suspense and a buzz around your upcoming sale can make it a bigger success. Why not tease customers with what’s coming up via email and post sneak-peeks on social media. The more buzz and suspense you can create around your sale the more momentum you will have during Black Friday and Cyber Monday. Abandoned carts are an unfortunate trait that comes with the territory of an e-commerce business. However according to Barilliance, the average cart abandonment rate on Black Friday to Cyber Monday in 2014 was 65%. Of course we want to keep that figure as low as possible and one of the best ways to do that is to create brilliant abandoned cart strategies. Consider sending tailored emails if a customer adds a product to their cart or contacts you about your services, and then never does anything else. That way you can contact them via a compelling email to bring them back to complete their purchase or booking. Nowadays we expect a lot of VIP treatment from brands we support (think of all those free coffees and special in-store events you get emailed about 24/7), so don’t be left behind. According to Clarify.fm it’s 50% easier to sell to existing customers than it is to brand new customers. This means that people who have already worked with you or purchased from you are far more receptive to your Christmas sales than those who just stumble upon your website. Re-targeting past clients doesn’t have to be a long-winded process, consider sending emails to your previous customers with great deals, a sneak-peek of your gift guides, promo codes or access to your sale earlier than the general public. You can download an email list of all your past customers from Tools > Marketing > Email Export Tool. Think of a couple of Black Friday/Cyber Monday blog posts that you can put out to your audience over the next few days. Blogging is a great way of hammering your sale home to clients without appearing to bombard them (as it might do via email or phone calls). Also spread your offers over your social media platforms, encourage conversation between clients and make sure that any questions from your followers are answered as soon as possible and to the best of your ability. Consider creating specific gift guides for both Black Friday and Cyber Monday. These could advertise and encourage your customers to purchase products or book services that you have planned in your ‘planned sales chart’. Exclusive promo codes or sales for your past customers/email subscribers. How many of us feel that customer service can sometimes go down hill when the Christmas rush sets in? The Christmas holidays are a time when you will potentially receive more questions and inquiries from customers, so be prepared. Make sure you respond to potential clients as quickly and thoroughly as possible. The other thing to remember is to provide courteous and respectful responses, even to uncourteous and impatient customers. One thing that can save you time and stress is to have a few canned responses prepared in Gmail. Also refresh your knowledge of providing first class customer service so it’s at the forefront of your mind. Google Analytics is a powerful, free traffic tracking tool that every business should be using. If you’re not already set up with Google Analytics (My Websites > SEO > Google Analytics) then get on it now! It will give you vital information on how your pages are performing and your bounce rate (how many people go to a page but then almost instantly leave). You’ll also be able to see how many people are visiting your site, where they’re based and how long they were active. The majority of us get major customer boosts during and around major events such as Christmas, Valentine’s Day and the wedding season. But why does your relationship with these seasonal clients have to end after the holidays? Instead take time and steps to maintain and nurture your relationship with new customers you acquired during the Christmas break. Keep your customers engaged with your business year-round by staying active on social media and on your blog, as well as sending out regular, informative emails. If your seasonal clients didn’t sign up for your email list or follow your social media accounts then re-targeting them, perhaps by phone, would be your next best option. A lot happens over the Christmas period – we work harder than normal, sell more than normal and interact with past and potential customers more than normal. Therefore, it’s a great time for you to take a look at any mistakes and successes that your business has made over those few weeks. This will also give you a benchmark for next year’s holiday offers while allowing you to improve and see what’s really working for your business overall. Make sure you make a note of all of this information as you, like everyone, will most likely not remember by next Christmas. What are you planning for Black Friday and Cyber Monday? How are you preparing for the holiday rush?